An internship that turned into a job has turned into a specialty for Tidewater Community College alum Ashley Hernandez. Hernandez graduated with a Career Studies Certificate in Veterinary Assistant last December; she was among the first cohort of students to complete the new program. The two-semester certificate requires back-to-back internships, and Hernandez was hired at the site of her second one, The Center of Veterinary Expertise (The Cove) in Suffolk. She was recently promoted to cardiology assistant, which allows her to gain a higher understanding of the inner workings of an animal, an area she said she never considered before. “I liked learning anatomy, so it’s a great fit,” she said. 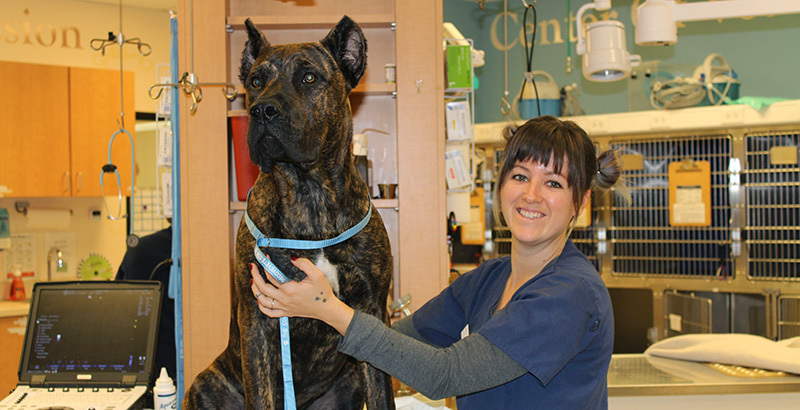 Like many aspiring students hoping to work in the veterinary field, Hernandez was unsure of what path best suited her. While working as a kennel assistant at Hickory Veterinary Hospital, she heard about the TCC program, which began in the spring of 2016. The 17-credit certificate, headed by veterinarian Megan Taliaferro, prepares students to assist and support licensed veterinary technicians and veterinarians in the health and handling of small domestic animals and exotic species. Classroom labs are hands-on, but students really get a chance to hone their skills at the required internships. TCC partners with various veterinary offices and hospitals in Hampton Roads, including The Cove, a round-the-clock care facility in Harbour View. Russ said interns at The Cove have a skills checklist and knowledge list that they follow to the letter. Hernandez, who eventually would like to specialize in large animal care, encourages students to take full advantage of the resources around them when they complete their internships. TCC’s veterinary certificate is one of 32 programs nationwide that has received approval through the National Association of Veterinary Technicians in America. For information about the program, contact Taliaferro at mtaliaferro@tcc.edu or call 757-822-7264.